The Cosmos quality, value-touring formula makes travel to the South Pacific truly affordable. Cosmos’ famous low prices—with nearly everything you need in a vacation already included—allow you to visit exciting locations in Australia and New Zealand without spending a fortune. Whether you have always wanted to snorkel at the Great Barrier Reef, explore the Great Ocean Road, or cruise on stunning Milford Sound, now you can discover the South Pacific’s most iconic sites on a Cosmos vacation to Australia and New Zealand. 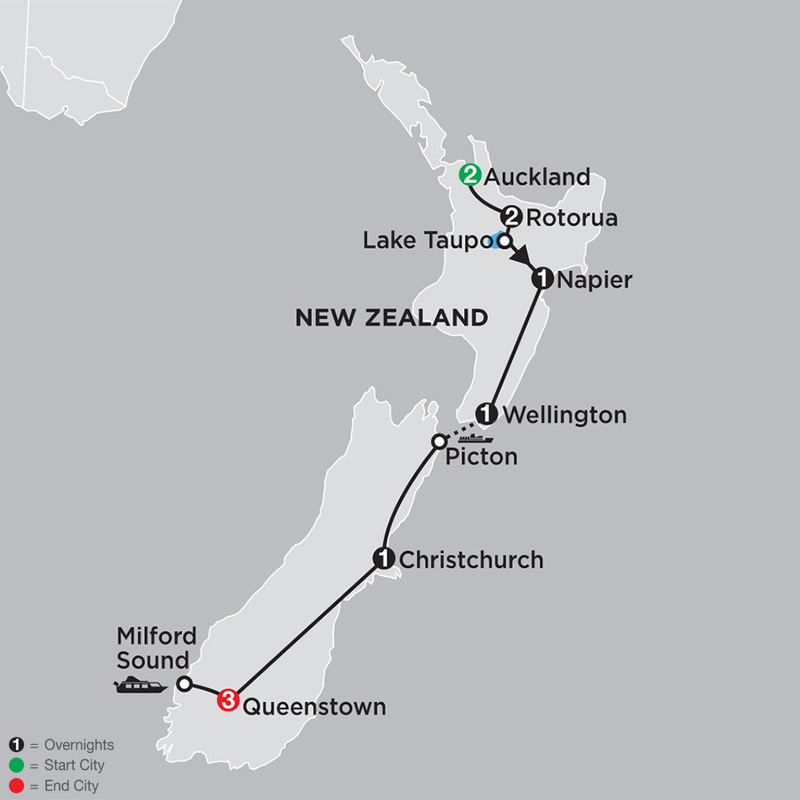 Your affordable New Zealand tour begins in Auckland with a two-night stay to start exploring this fascinating country. Enjoy a sightseeing tour of the city, including the Domain—its park surrounding a dormant volcano. You’ll travel through the lush farmland of Rotorua, home to ...Read More. Stunning natural attractions, vibrant cities, remote regions, and friendly people…this is Australia, and on this Australia tour, you’ll experience all of this and more. 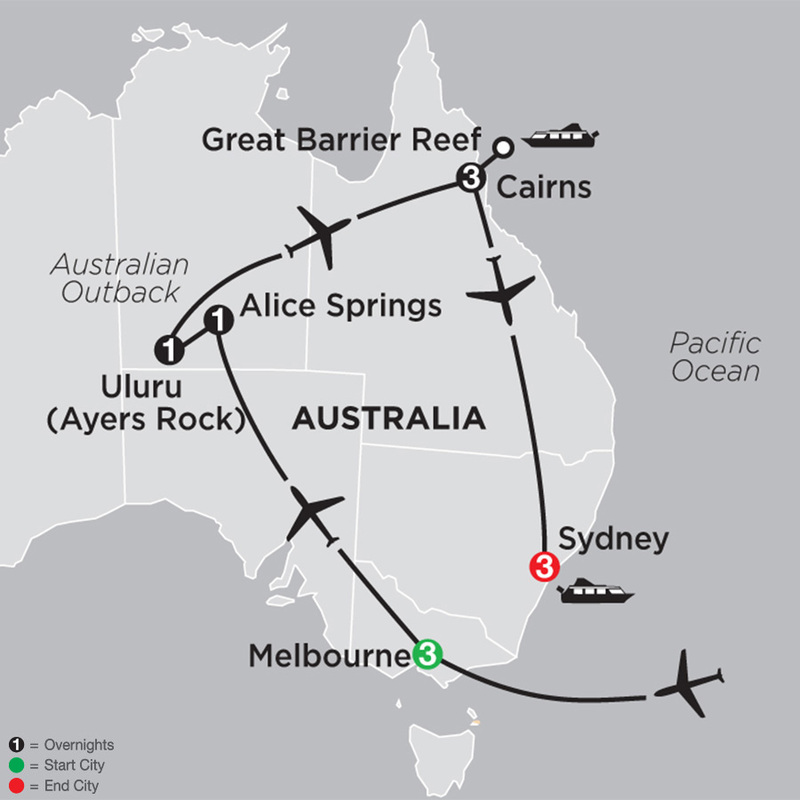 Start in Melbourne, end in Sydney, and overnight along the way in Alice Springs, Uluru (Ayers Rock), and ...Read More. Begin your value-minded tour with three stunning nights on the Coral Coast of Fiji. Arrive in Nadi, Fiji, and settle into your oasis with a few days to indulge in spa, golf, beach, or pool time in this island paradise. 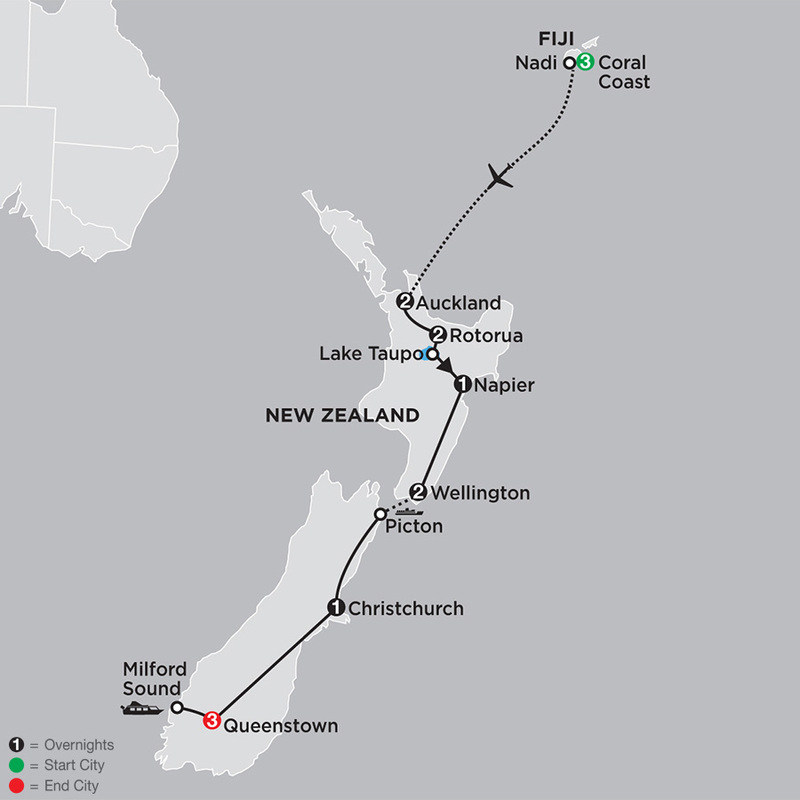 Your affordable tour continues to Auckland, New Zealand with ...Read More. Stunning natural attractions, vibrant cities, remote regions, and friendly people…this is Australia, and on this Australia tour—with Fiji—you’ll experience all of this and more. 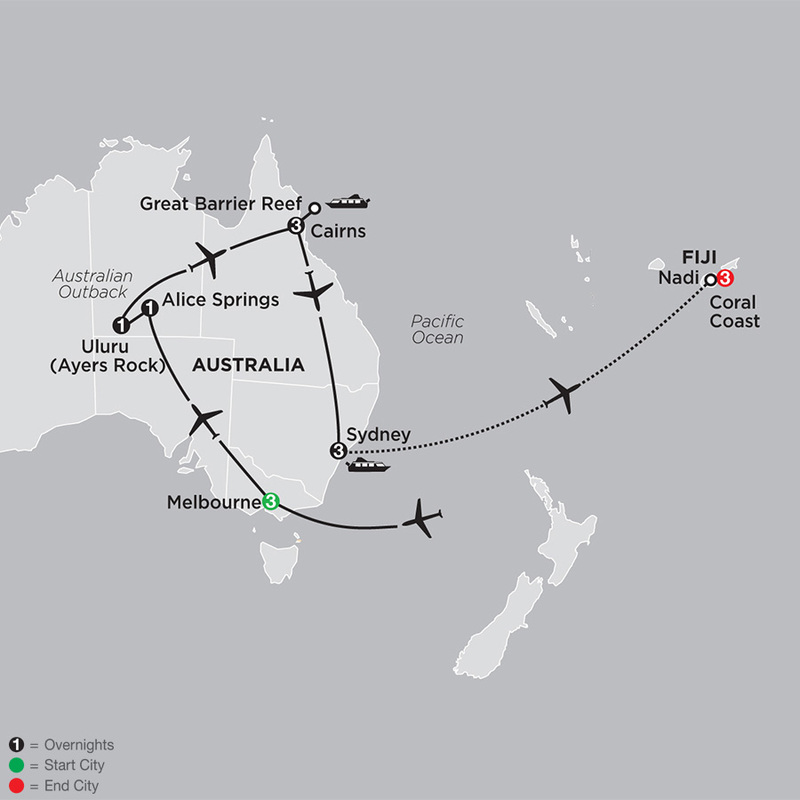 Start in Melbourne, end in Nadi, Fiji, and overnight along the way in Alice Springs, Uluru (Ayers ...Read More. At Globus, we create first-class South Pacific escorted tours with just the right balance of included features & free time. We’re all about hidden gems, not hidden charges. We throw in more visits, toss in more experiences & include more sightseeing. Monograms is ideal for travelers who prefer just the right amount of support. It offers all-in-one packages to Australia, New Zealand and Fiji that cover all the details and the services of a professional Local Host. Monograms takes care of the details.